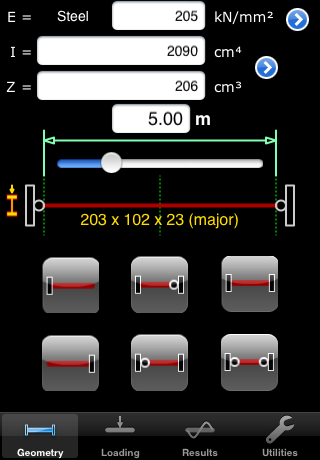 Structural/Civil Engineering App for elastic analysis of general 2D plane-frames. 2D structural frame models can be created and analysed. There is an emphasis on quick and precise input of high-resolution data through graphical tap-and-drag interaction, with numeric input available as an alternative. Automatic concurrent analysis ensures that up-to-date results are conveniently available after every edit. Clear graphical representations of deflections and force envelopes are interactive with slider bars for reading off results at any point along the members.